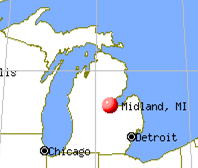 Midland, Michigan is located mid-section of the Michigan mitt, near the crook of the thumb. Together, Saginaw, Midland and Bay City make up the area commonly referred to as the "Tri-Cities," although Midland is considered a micropolitan, according to U.S. Census data. As far as population numbers, Midland is the second largest of the three cities. Saginaw is the largest; Bay City, the smallest. Midland has evolved from an Indian village to the "City of Science and Culture." The thousand acres now known as the Chippewa Nature Center originally were within the 6,000 acres retained by the Chippewa under the Treaty of Saginaw in the year 1819. Following the era of Indian hunters, fishermen and white fur-traders were farmers and loggers. The second largest sawmill in the Saginaw Valley was located in Midland. Midland County was organized in 1850. By 1874, the Flint and Pere Marquette Railroad extended through the heart of Midland to Averill, three miles west. The City of Midland was incorporated in 1887. In 1890, a young man by the name of Herbert Henry Dow arrived in Midland and subsequently founded The Dow Chemical Company. His success enabled Midland to survive the end of the logging era and to grow to its present size. Now the heart of Michigan’s technology basin, Midland is the global headquarters of two Fortune 500 companies, Dow Chemical and Dow Corning Corporation, and home to the Midland Cogeneration Venture, the largest gas-fueled, steam recovery cogeneration facility in North America. Midland has become a center for industrial innovation. Residents and tourists alike enjoy Midland’s abundance of cultural and recreational facilities. The Midland Center for the Arts, Herbert H. Dow Museum, Dow Gardens, Herbert D. Doan Midland County History Center, and the architecture of Alden B. Dow are several attractions which reflect the culture and heritage of Midland. The Great Lakes Loons baseball team, a brand-new 107,000-square-foot Civic Arena with three skating rinks, Midland’s 30-mile-long, paved Pere Marquette Rail-Trail, the Midland Community Tennis Center, a soccer complex, a Community Center, 72 different parks and the Emerson Park and Redcoat softball complexes provide residents with many recreational opportunities.